Located on Main Street in downtown Wilton, New Hampshire. There are a few parking spots located in the rear of the Town Hall on Maple Street, and along Main Street for people with mobility issues. All other customers are encouraged to park in the municipal parking lot located next to the police station. 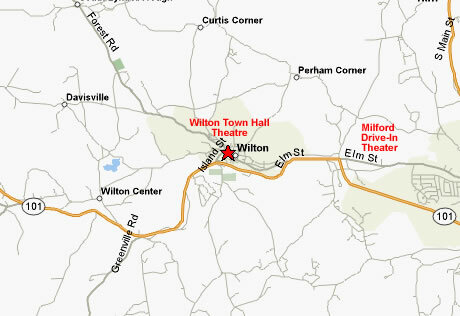 Referring to the map below, the Wilton Town Hall Theatre is located in the Town Hall building in the center of downtown Wilton. The areas shown in green on the map are parking areas. The area shown in blue is a suggested parking area for Mobility Challenged individuals. The signs on Main Street indicate Two Hour Parking. The intention is 8 AM - 5 PM on Weekdays. This doesn't apply on Saturdays or Sundays. Take Rt-101 West to Milford. At the first traffic light, you will see a State Police barracks on the left and a large fountain on the right. Proceed to the next traffic light and make a left, which is still Rt-101. Continue 8/10's of a mile from that light, you will see another traffic light with a "Y" intersection. Bear to the right at this intersection and this will lead you to the downtown section of Wilton in about 9/10's mile. Caution... The speed limit is 20 MPH! The theater will be on the right side of the road in the downtown section. Take Rt.101-A (aka Amherst Street) until it intercepts Rt-101. At Rt-101, you will make a left turn onto Rt-101 and proceed West for roughly 3 miles. At the first traffic light, you will see a State Police barracks on the left and a large fountain on the right. Proceed to the next traffic light and make a left, which is still Rt-101. Continue 8/10's of a mile from that light, you will see another traffic light with a "Y" intersection. Bear to the right at this intersection and this will lead you to the downtown section of Wilton in about 9/10's mile. Caution... The speed limit is 20 MPH! The theater will be on the right side of the road in the downtown section. Take Rt-101 East and follow it to Wilton. 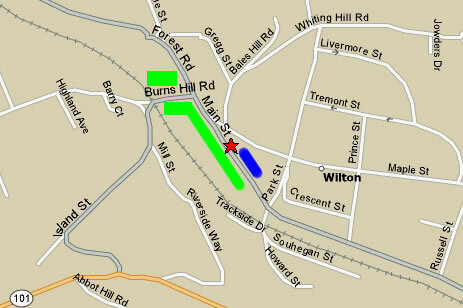 You will see a sign at the traffic light indicating to make a left to to downtown Wilton. Take that left. Follow Island Street to Burns Hill Road. Cross the railroad tracks and bridge. Bear Right onto Main Street. 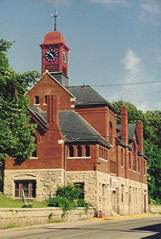 The Town Hall Theatre is 500 feet ahead and on the Left. Caution... The speed limit is 20 MPH! Depending on the make and model, you can either enter the address as 40 Main Street, Wilton NH or you can enter the coordinates of the building, 42.843 N, 71.374 W.
Website designed by R. L. Shields Associates, Inc.